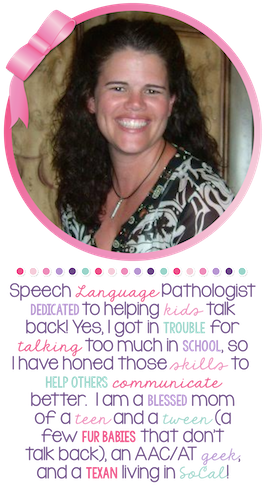 In my post on functional core vocabulary, I shared the importance of vocabulary choices for your child (student/client). This post will discuss and show some examples of a starter page for core vocabulary. In my posts, I will show pictures of starter pages using Proloquo2go. I use Proloquo2go partially because I have used it for the last 8 years and love the versatility, but also because it is one I own on my personal iPad. I have also used TouchChat and Lamp “Words for Life” with my clients. I have found both to be great programs, but I do not have continuous access to them. I am currently doing a trial with the DynaVox iPad app. I am currently on an app “restriction”, so I can’t purchase any new AAC apps for a bit! 1. The first screen should be the starter screen for the child!!! The individual should not have to navigate for their vocabulary. When I want to add specific activities to a students AAC device, I embed a folder that does not impact their navigation. 2. We don’t want a page with 50+ nouns! Use subjects, verbs, and objects (nouns) on the starter page. 3. The starter page should be designed with navigation from the start. The starter page should keep the structure or organization of the program that you are using when applicable. Consistency in the colors for the vocabulary. The colors may vary from program to program, so keep it consistent. This may seem silly, but this is another way to teach meaning and associations. Mask (hide) words or folders that you do not want to use at that time. I often hide “reinforcers” or “choices” when they aren’t available. 4. Starter screen example: The picture shown is a starter screen for an early communicator. I have a subject, the 4 target verbs we are working with, and 3 navigation folders. The navigation folders include, more subjects, verbs, and a “things” folder. 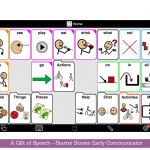 A Gift of Speech: starter screens, AAC, and functional core language.